During a piece on September 17th for Spike TV’s “Friday Night Lights Out” show, our Chicago team got inside the life of Boxers and MMA fighters. 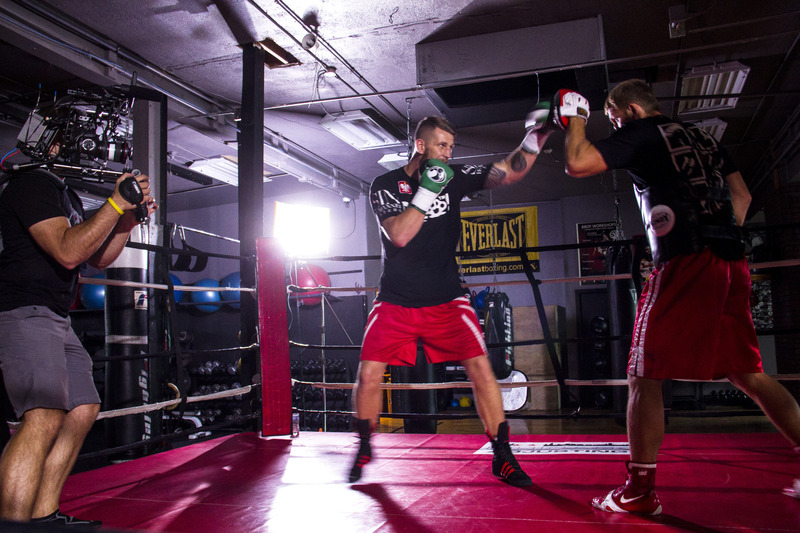 They shot several stand-up interviews with Boxer, Andrzej Fonfara, in his gym just outside of Chicago. The producers of the show allowed the crew to have full creative control inside the boxing gym. Our crew used HMI’s and Kino Divas to light the interviews. By controlling the light from the HMI’s they were able to shape the background by using the boxing bags to block the light and create harsh lines along the floor. The HMI’s also highlighted the boxing bags and provided a back-light for the show’s host, Dana Jacobson. Dana Jacobson interviews Andrzej Fonfara. During the shoot Jacobson held a “speed bag round” of questions in which she rapidly asked Fonfara questions regarding his favorite movie, food, and celebrity while he simultaneously hit the speed bag and answered the questions. Fonfara was also questioned about his upcoming fight in late October against Nathan Cleverly. The crew finished off the shoot with B-Roll of Fonfara and his trainer working in the ring. The episode they shot aired Friday night, October 16th on Spike.